We have a highly caring team of quality individuals who love what they do in caring for your pets! The Cooke Veterinary Medical Center opened in Chesapeake, Virginia in November 2002. The hospital was designed by Dr. Denette Cooke to offer the patients and clients warm, comfortable, and charming surroundings while providing our guests with the highest quality and highest technology veterinary medicine available. We strive to involve the entire health care team, which centers on the owner, to heal our patients together. Dr. Denette Cooke was born in Norfolk, Virginia and grew up in Virginia Beach, where she graduated from Green Run High School. She then attended Berea College in Berea, Kentucky in 1987 and graduated with a Bachelor’s degree in Chemistry. After working as an environmental and industrial chemist for 5 years, she attended the University of Florida College of Veterinary Medicine. 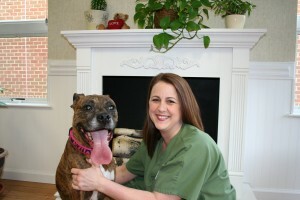 Dr. Cooke graduated with a Doctorate of Veterinary Medicine in 1996. She practiced small animal medicine and surgery in Lynnwood, Washington for 2 years before moving home to be closer to family and friends. After working at Pembroke Veterinary Clinic in Virginia Beach for 4 years, she opened The Cooke Veterinary Medical Center in Chesapeake, Virginia in 2002. Dr. Cooke enjoys all aspects of general practice, including surgery, dentistry, and internal medicine. She especially enjoys senior patients with their unique needs and she integrates ancient, evidence based medicine (acupuncture and herbals) into their healing protocols to alleviate pain, thereby giving many patients a higher quality of life than western therapy alone. She loves to incorporate the best aspects of all medicine to help the clients offer their pets the best approach to medicine that is possible. She completed her certification in acupuncture in 2008 where she attended the Chi Institute of Traditional Chinese Veterinary Medicine in Reddick, Florida. Dr. Cooke keeps her medical and surgical skills on the cutting edge by attending extra continuing education every year that is required by the state of Virginia. She has special interest in a ‘whole pet’ approach to healing that incorporates family life style, breed life style, physical exercise, diet and nutrition, and the best medicine to maintain a healthy and productive life for your pet! She enjoys lecturing to health care groups on integrative veterinary medicine, such groups include the Alternative Medicine Club at the Virginia Maryland Regional College of Veterinary Medicine, Chesapeake Public Health Department, and the Prudent Center in Suffolk. When Dr. Cooke is not practicing veterinary medicine, she enjoys gardening, outdoor activities, motorcycling, and spending time with family and friends. A good day is walking a pack of dogs in the park! Her pack includes Italian Spinonis, Corgis, a heart stealing mutt and 2 gorgeous domestic shorthaired kitties! 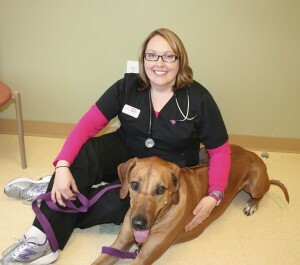 Dr. Rebecca Marr joined The Cooke Veterinary Medical Center in July 2013. She grew up in Marrietta, Ohio and studied zoology at The Ohio State University before being accepted to the College of Veterinary Medicine in her junior year of undergraduate training. In 2002, she graduated from The Ohio State University with her doctorate degree in veterinary medicine (DVM) before moving to Virginia Beach to begin her professional career. 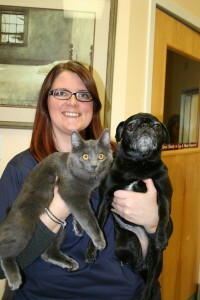 She has worked in the Hampton Roads area as a small animal practitioner and also with the military. She enjoys all aspects of veterinary medicine including dentistry, surgery, preventative medicine, education, teaching, and overall health and wellness. She has worked as an emergency veterinarian, relief veterinarian, associate veterinarian, and also as a professional consultant and researcher. Dr. Marr is excited to begin her education and training with Traditional Chinese Veterinary Medicine under the curriculum studied by Dr. Cooke and increase her ability to care for her patients with more knowledge and skill. She lives in the Kempsville area with her husband, Rhodesian ridgeback, grey tabby cat, and fish. In her free time, she enjoys walking her dog, riding bikes, boating, kayaking, gardening, baking, and socializing with friends and family. I was born and raised in the Virginia Beach area. After graduating from Green Run High School, I attended and graduated from Central Carolina Community College in 1984 with a degree as a Licensed Veterinary Technician (LVT). 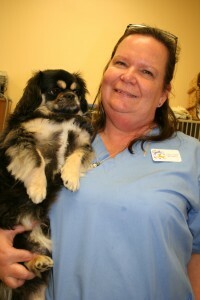 Over the years I have worked in emergency and small animal practice in the Tidewater Area since that time. I have a special interest in Traditional Chinese Veterinary Medicine, diet and nutrition and preventive medicine. I have been with Dr. Cooke since the practice opened in 2002. In my spare time, I practice Tai Chi. I have a various assortment of dogs, cats, and a few exotic animals. I joined the Cooke Veterinary Medical Center as a Veterinary Assistant in May 2005. I have over a decade of experience in the veterinary field. I have worked in all aspects of the veterinary hospital and am the Team Coordinator. Of all the clinics I have worked in over the years, the Cooke Veterinary Medical Center has the most intuitive, caring doctors and staff. I grew up in North Carolina, where I started working at a small animal clinic at the age of 20. Working in North Carolina and Virginia has given me experience with large animals, exotics and small animals. Working with such a variety of different types of animals has taught me many caring and compassionate handling techniques. I enjoy spending time and bonding with the pets that typically do not enjoy seeing the vet, so that I can try to make their experience less stressful. I spend most of my free time with my son, husband, and playing with my pack of energetic Pugs! I’ve been with the Cooke Vet family since 2009. I am the happy voice you hear at the other end of the phone! I am happily married with two children and have a Boxer named Mia, a French bulldog named Breezy, and 3 kitty sisters, Emma, Annie, and Nada. I love everyone’s pet, although I am a little partial to Boxers and Frenchies! I joined the Cooke Veterinary Medical Center team in 2006 after my retirement from another career. I serve as an administrator handling Quick Books, accounts payable, and payroll. Other jobs I enjoy are typing in reports and lab work, as well as helping out with the laundry and holding sleepy babies after surgery. I have two orange cats, Matlock and Mason, and a Papillion mixed dog named Tippi. I joined the Cooke Veterinary Medical Center in the Fall of 2013. I enjoy coming to work each day and helping our patients and meeting their owners. I always knew I wanted to work in this field. I grew up in Michigan ice skating and coaching hockey. I joined Club Med when I was in my early twenties, which allowed me to live in different states and countries. I love spending time with all my animals, traveling, and snorkeling. I am a Veterinary Assistant with over 15 years combined experience in small animal and exotic animal veterinary medicine. I earned a Bachelor of Science in Biology from Old Dominion University. My areas of interest include microbiology and laboratory diagnostic testing. I began here at The Cooke Veterinary Medical Center in 2007. I enjoy life with my husband Ben, our two children, and our kitties.